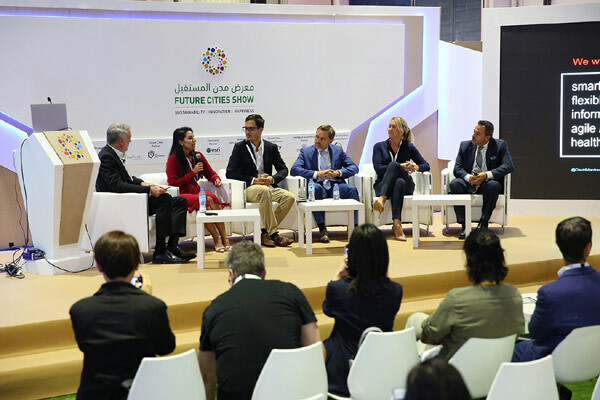 The race to become the world’s first smart city has become more exciting with recent and wider applications of disruptive technologies, said experts ahead of the third edition of Future Cities Show in Dubai. With the theme ‘Propelling Globalization through Digital Transformation’, Future Cities Show, to be held from April 8 to 10, will support the growth of smart city solutions such as artificial intelligence (AI), blockchain, smart mobility, smart infrastructure, and sustainability as catalysts in achieving a healthy global digital economy. It will do so by providing the platform for homegrown and international technological innovation to attract scalable investments, they stated. The building blocks for smart cities will also be showcased at the upcoming event, said the organisers. Dubai leads the technological revolution in the region by establishing Smart Dubai as the lead government agency to propel the city to become the world’s first blockchain-powered government by 2020, they stated. Additionally, the city aims to become the world’s hub for 3D printing, and reach 25 per cent driverless transportation by 2025. Dubai’s futuristic vision is shared globally. International governments, cities, and corporations have new-age technological innovation ideas, but they need to pull in investments to harness the full potential of their smart city infrastructure and its relevance - from technology base to special application, public usage, and experience, said the organisers. The upcoming show bridges this gap by linking them with investors who are keen to support creative ideas using disruptive technology during the three-day exclusive event. The event anticipates participants from over 20 countries. Dawood Al Shezawi, the head of the event's organising committee, said: "Smart city solutions will change the way we live. These disruptive technologies will tip the balance between increased efficiency and stagnant productivity. However, they need access to a strong network of business partners, which the expo will provide." The upcoming event encourages the participation of countries, cities, and corporations with smart city solutions that involve the use of Artificial Intelligence in its application. These projects address the challenges of technology adoption by multiple sectors including agriculture, call centers, customer experience, energy and mining, healthcare, intellectual property, information and communication, technology, manufacturing, retail, and software development, he added. According to him, the participants with smart infrastructure projects can maximise the $3.7 trillion global investment, which is expected to be infused until 2035, providing a competitive advantage for increased efficiency of the economy, transportation, public order and protection, utilities, roads and bridges. The global investment will also be utilised to develop underground technology, BIM(building information modelling), GIS (global information systems), drainage and sewerage, sensors, monitoring technologies, green building solutions, lighting, stated Al Shezawi. Investment in AI is expected to reach $89.9 billion by 2025 worldwide, with growing investment interest in quantum computing. This will enable faster processing of larger complex algorithms, it added. Al Shezawi pointed out that blockchain, or digitisation of asset management, had been attracting investment interests with an anticipated global investment reaching $300 billion. Among the sectors benefiting from blockchain ideas are banking and financial institutions, critical infrastructure security, internet advertising, crypto exchanges, education and academia, industrial IoT, real estate, supply chain management, government and public records, retail, human resources, law enforcement, business, and corporate governance, he noted. Al Shezawi pointed out that there was a fundamental takeaway when supporting disruptive technologies at this early stage. "By investing in smart city solutions now, you are funding the future. It’s all about getting there first and then subsequently enjoying exponential returns on investment," he noted.